COUCH SURFERS The Winterblast parade features artfully designed couches on wheels. For more info, go sofasantarosa.com/sofa. Electric sofas, stilt walkers and nighttime marching bands are a taste of what's to come at the 11th annual Santa Rosa Winterblast. The event, in Santa Rosa's SOFA district near Juilliard Park, is really a big block party—with a parade of rolling sofas thrown in. Best of all, it's free and family-friendly. Atlas Coffee owner James Podchernikoff is back for his third year as lead organizer of Winterblast. What's he looking forward to? Big puppets on parade. Teachers from Sonoma Academy and Roseland University Prep are creating massive street puppets, some of which will require several people to operate. Winterblast is very much a collaborative effort. "Over the years, the event organizing has been tossed around by whoever arrives to volunteer," says SOFA artist and designer Michele Bottaro. "SOFA is a group of creative friends who have shops or studios and help to pitch in to make the event happen." Gallery 300, Chroma Gallery, Backstreet Gallery, the Free Art Friday group and the Imaginists will all display artwork in the deceptively extensive one-block radius surrounded by South A Street, Sonoma Avenue and Santa Rosa Avenue. Many galleries connect to each other, enabling patrons to walk through a labyrinthine collection of mixed media. 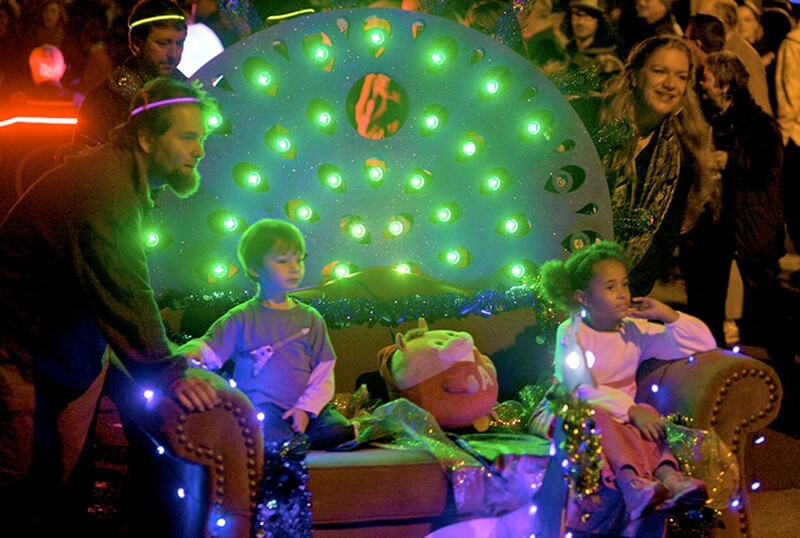 To go along with the SOFA acronym, parade-goers are invited to decorate their own sofas, add wheels and bring them no later than 5:45pm for the parades at 6pm and 8pm. Fire dancers from Aries Fire Arts Collective take to the streets at 7pm, the "Winter Queen of Faeries" drops in to grant wishes and the "whiskey-drome" will feature daredevil bikers riding near-vertical walls on wooden slats, like the inside of a barrel. Jessica Rasmussen, one of the artists showcasing work in the Imaginists space, plans to display art made out of found objects and papier-mâché. She is also part of the Free Art Friday group, which is celebrating its first Winterblast inside Criminal Baking Company and Undercover Noshery. They are expecting 20 to 30 artists. As for music, the FogDub band will play dub and horn tracks in the courtyard of Atlas Coffee. At a different corner of the festival, the Bad Apple String Band will play Americana and bluegrass for free behind Chroma Gallery from 6pm to 9pm. Meanwhile, roving entertainers JD Limelight, Krysta Hodson and Frosty the Snowman will be there to dance, play accordion and perform around the festivities. Jeremiah's Photo Corner will offer tintype photography to document the good times. For something to eat, look for the Seed on the Go vegan truck, Canevari's Deli ravioli, Parkside Cafe and Criminal Baking Co. Between the light-up sofas, costumes and fire poi-swingers, it will be hard to miss this little section of Santa Rosa spirit. Winterblast takes place on Saturday, Nov 14, 312 South A St, Santa Rosa. 5pm. Free.